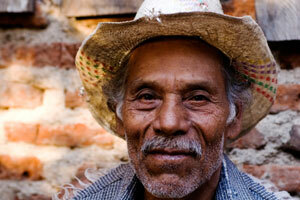 Canadians drink tonnes of tea – come to our party to find out why Fair Trade tea is the best! Sample a variety of black, green and herbal teas. Free gift for Mom’s – their day is the day after, don’t forget. There’ll be music, kid’s activities; including making ‘Sun Tea’ (Bring a 1 litre jar), local food and producers. Dress up for extra fun! Prize for best tea party hat. Bring your most interesting/beautiful tea pot for our display table and you could win a prize. Also please bring cutlery to donate to the Dish Library – now based at the Centre Wakefield. They are short on cutlery. ... and support local producers at the same time! 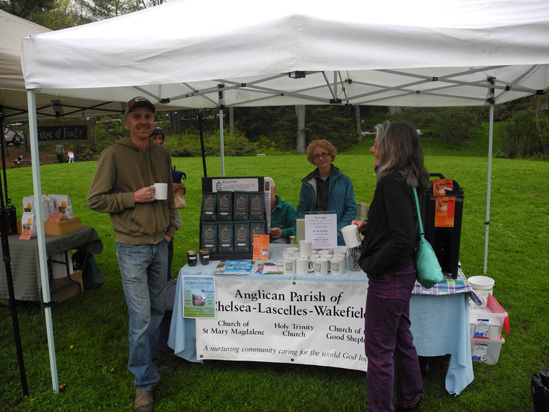 Saturdays, 9 am to 1 pm at the Wakefield Market (Riverside Dr. & Legion Road - near the Alpengruss restaurant). Crafts and activities start at 10:30. We'll learn about the realities for many children around the world working in hazardous conditions with no schooling. Find out how to make a difference by shopping for and creating a demand for goods that are produced in safe conditions by workers receiving fair pay. That’s what Fair Trade is all about! Local participating shops make it easy by offering Fair Trade coffee, tea, cocoa, chocolate, sugar, spices, bananas and jewellery. Come to Fair Trade Day to learn more about how we can all fight child labour and exploitation. Displays and participation by World Vision Canada. 11:30 – Parade: all bring along instruments to join in the ruckus and celebration! Visit our photo gallery to see pictures of past events and other stuff. Anne of Bean Fair is the Chair of the Wakefield, La Pêche Fair Trade Steering Committee! 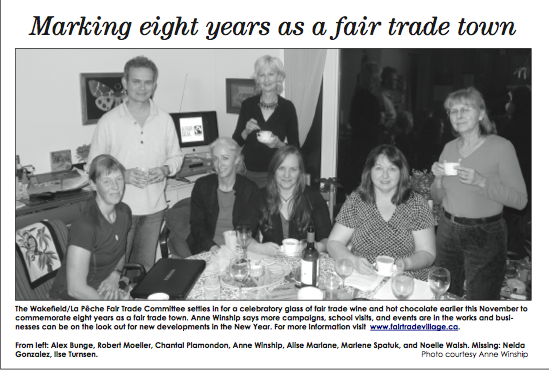 Every May to mark fair trade weeks in Canada (always the first two weeks of May), there will be some kind of celebration or fair in Wakefield.